Ready to jump on the fruit grilling bandwagon?? It’s a simple way to grill up something healthier than a s’more but (almost) just as much fun. 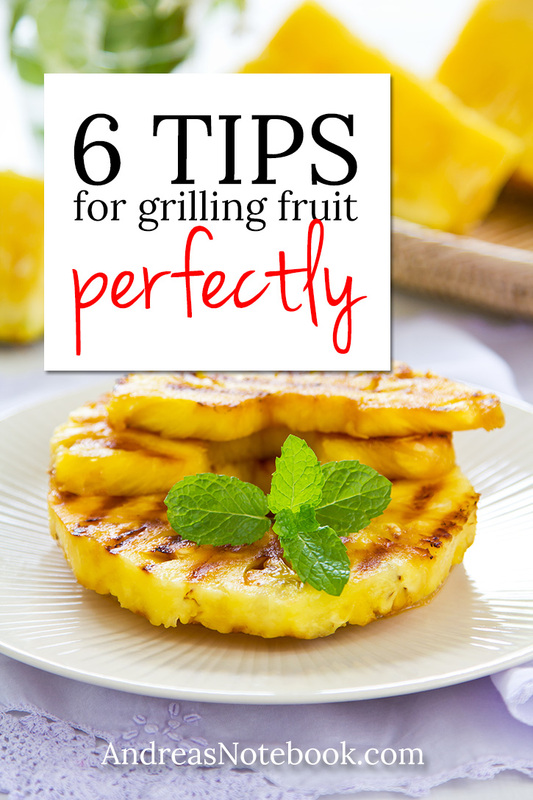 I’ve got 6 tips for grilling fruit perfectly and I know you’re going to get hooked! Grilling caramelizes the natural sugars in the fruit creating a deeper, more intense flavor. Do you need another reason? Clean and oil your grill plate. This will keep the fruit from sticking. Give the fruit a quick coat of oil as well. Use fruit that is ripe and firm. Overly ripe fruit will not hold it’s shape. Keep the skin on! This will help keep some of the juices inside. Soft fruits like pineapple, peaches, plums and figs are better suited to direct grilling over high heat. Cut them in half. Put small fruit on skewers. Looking for sweet? Brush the cut fruit with honey, syrup, molasses or even wine before grilling. Mangos, pears, peaches, apples, figs, pineapple, bananas, plums, papayas, nectarines, and apricots grill nicely directly on the grill plate. Try strawberries, figs and cherries on a skewer to prevent from sinking through the grill plate. Need some recipes to guide you? We’ve got you covered here.